I will attempt to answer all of them, and even go a bit further, in this article. Which one is better: KIS or KTS? I can’t help but ask a counter question: What is your purpose? Before choosing a product, you need to understand the purpose of the solution you seek, and what capabilities are required. The level of protection against viruses and threats is the same for both. The malware signatures and cures are also identical. Even the components listed in the “Protection” tab are the same. However, a number of additional capabilities Kaspersky Total Security offers are not present in other products from the ‘home’ portfolio. These features, to some extent, serve as a means of data protection. To get a closer look, let’s launch the main window of the program. 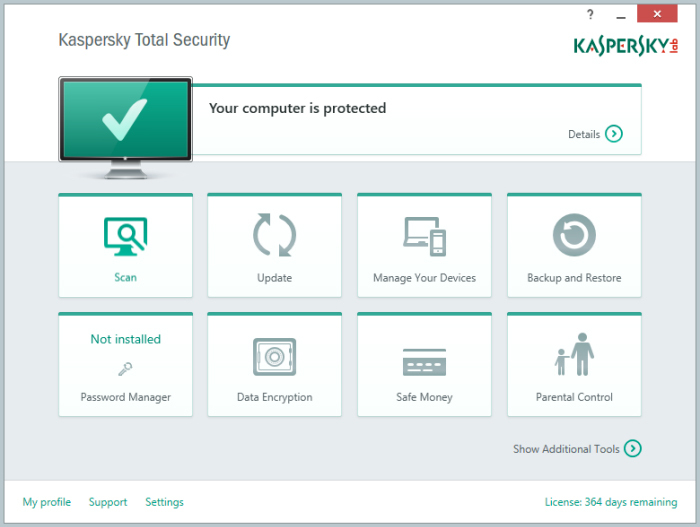 We start with a capability that allows management of all devices on which Kaspersky Total Security is installed, with the help of My Kaspersky portal. Management, in this case, is an ability to remotely access the software from any location and any device through a web interface. After logging into the portal and finding the device you need in the list, you can: find information on the license and level of protection, run a quick or full check, update databases, or turn on/off any protection component. All of this is available at your fingertips wherever you are – for instance, on a beach, with a tablet in your hands. Data backup is a measure strongly recommended by all security experts. Any hardware is prone to breaking unexpectedly, at the most inconvenient moments – Windows OS may make you wonder at any time. In order to keep your data safe whenever you restore you operating system, all information should be backed up so you can restore the data in case of failure. That’s what we mean by backup. In order to get enough of storage, one could use Dropbox – a cloud storage service. In the event of Windows letting you down, your beloved photos will still be available. In case your data is too critical to store as is, Kaspersky Total Security can allocate them to a virtual safe box. The files you prefer to secure will be encrypted by a method resistant to hacking and will be decrypted only upon entering a password – like in a bank depository! So, the only task a user is responsible for is keeping the password safe by not leaving it laying around written on a piece of paper – and, of course, not forgetting the password! Kaspersky Total Security will take care of the rest. By the way, passwords. Right. One of the most useful features in Kaspersky Total Security is the Password Manager. Over the past few years it undertook various transformations and was fully modernized. Now, it looks quite hip and, moreover, employs smart algorithms to generate reliable passwords and store login credentials in a database. All passwords are synced to the cloud, so they are available from any device where Password Manager is installed. Also, this software is now compatible with iOS, OS X, and Android in addition to Windows. Once a password is added to the database, it is available on any device you use to log in – a tablet, a smartphone, etc. Note: You must have a user profile on My Kaspersky to use Password Manager or remotely manage your devices. 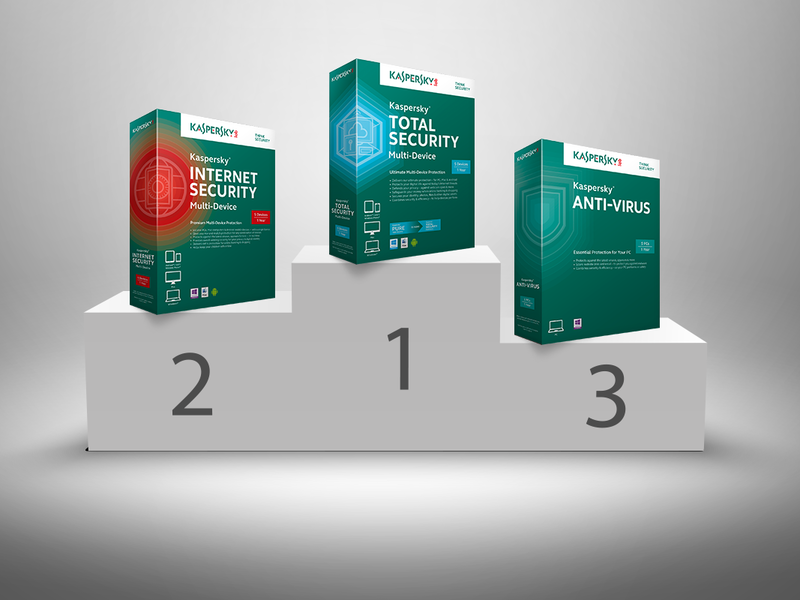 To sum it up, Kaspersky Total Security is Kaspersky Internet Security enhanced with a number of useful and user-friendly tools. Of course, you can continue to use siloed products to enable each of these additional features (excluding remote management tool) and employ Kaspersky Antivirus to fight malware. That’s a feasible approach, but it will be hard to tell whether software products by different vendors are fully compatible on one machine. Also, managing the entire batch of programs is not going to be easy: There is no single entry point to tame all of the software you have. However, as I have said before, this article is meant to explain differences between the products, and it is up to you to decide which one is best for you, depending on your needs and requirements. I can promise one thing: both are of supreme quality, as always.